Fall has arrived in San Diego. This morning on our hike Jeff and I could see our breath in the blustery morning air. We loved it. There's nothing like a chill October morning with a crisp blue sky to evoke feelings of nostalgia. Within minutes of our hike, our talk turned to missing New England and our autumn traditions, like apple picking, pumpkin carving, and decorating for Halloween. One person in particular has been on our mind: my grandmother, Nan. I have written about Nan numerous times on this blog, and many of my regular readers feel as if they know her. Last October 5th, Nan turned one hundred years old. She had no idea of the significance of the day. But she did love her whipped cream covered chocolate cake with pink roses, so much so, that she ate two big slices. Watching her enjoy that cake was the best part of the day. This past July, Nan passed away peacefully, with my mother by her side. Yes, she was fortunate to live to 100. Still, I miss her. We all do. Next week Jeff and I are going back to Rhode Island. This morning on our hike, I instinctively said to him, "When are we going to visit Nan?" Then I realized, Wait a minute. We can't visit Nan. It's strange how that happens. Feeling blue for Nan and for New England, I decided to make us something soul-soothing: Nan's Italian Chicken Soup with Escarole. What made her soup special was escarole -- a crisp, bitter type of endive that lends robust flavor. If you're wondering where the mini meatballs are, you won't find any here. Nan couldn't abide meatballs in chicken soup, and neither can I. That's all there is to it. This recipe is based on Nan's soup, though it isn't her exact recipe. It couldn't possibly be -- she never used recipes. For her, it was always just "a little of this" and "a pinch of that." This won't taste exactly like Nan's -- no one's ever could -- but it will sooth your belly and your soul. The way only your grandmother's chicken soup can. Thanks, Nan. 1. Preheat oven to 350 degrees F. Line a large rimmed baking sheet with tinfoil (for easy clean-up). Drizzle 2 tablespoons olive oil over chicken. Sprinkle with several shakes of salt and pepper. Place in a single layer on the prepared baking sheet. Cook for 30 minutes. Remove, and cool slightly. Then using a fork, shred the chicken. 2. Meanwhile, in a large pot over medium heat, add remaining 2 tablespoons olive oil. Add onions, carrots, and celery, and saute 5-7 minutes, or until lightly browned. Add the cooked chicken and broth. Bring to a boil. Reduce to low. Add escarole, salt, crushed red pepper, parsley, and cheese. Cook for 20-25 minutes. Taste it, and adjust seasonings as needed. Add cooked pasta, if desired. Otherwise, serve hot, and garnish each serving with additional grated cheese. *Nan would add the cooked pasta only just before serving so it wouldn't soak up all the broth. I do the same. 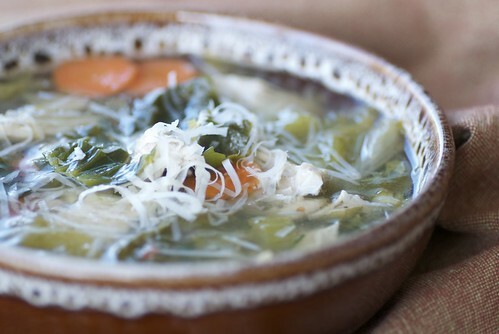 I'd also highly recommend serving some crusty Italian bread with this soup. How are else are you going to sop up the broth at the bottom of the bowl? My Grandma just died in May at age 91. I still catch myself thinking about going home and seeing her, and then it sinks in that I can't. Although I really miss her, she was a terrible cook so unfortunately there aren't any recipes of hers to whip up and remember her by. I think I'll make this soup in honor of her and all other grandmothers! You are lucky you have a recipe from your grandmother. My sassy Irish grandma would never share her recipes. She said it would be a good way for us to miss her when she died. And it truly is. What I wouldn't give for her macaroni salad recipe. What a sweetie your grandma must have been. My own grandmother lived to be 93 and I treasure the memories so much. My mother passed away 3 years ago and I've found it amazing how many memories are attached to the food! This soup looks delicious,comfy and soul warming, perfect for cool fall days! I'm pretty sure if I asked my grandmother for a recipe, she'd furrow her brow at such a strange request. Indeed, you just add this and that! I'm so sorry to hear of your loss, Susan. What a lovely tribute to your Nan. Escarole soup was one of my dad's specialties. He used to add cannellini beans too. So funny to stumble upon this post today. I, too, am ex-pat New Englander in Southern California. Our "chilly" fall weather this morning found me making turkey soup from the turkey we bbq grilled yesterday. When I spoke with my mom, she implored me to go get some escarole for the soup. I always thought that was our little quirky italian/english trick. So glad to share :) I lost my Gram 20 years ago and still think about her all the time - especially when I'm cooking and I wonder what tip or trick she'd share. How wonderful to have had the time and experiences you had with your Nan. :) And yes, I'll probably make a quick trip to the store tomorrow to pick up some escarole! What a lovely post. I remember reading about your grandma, but I didn't realize she had died. I experienced that with my mom dying, thinking I would tell her something and then realizing I couldn't because she was no longer here. I think it's wonderful that you're able to remember her though her recipes though. I LOVE the new photo of you. Really captures your beauty! The blog is looking good! Your grandmother is the link to your roots Susan and as long as you remember your grandmother and her recipes that link will never break. Great tribute to your nan and great recipe. Thank you for sharing this recipe. Lucky for you to have a Grandma who knows how to really cook and a good one. This is like paying tribute to her. Nice! Well, I know my later Grandmas knows how to cook but I wasn't able to spend real time with them be able to learn some of their recipes. I wish I had. What a nice way to remember your Grandma. Your Nan lived a long and rewarding life surrounded by a loving family. Thanks for sharing her soup and her memories with us. cate-I love the idea of making the soup in honor of all grandmothers! Just lovely. rookiecookie-Food and memories are so closely intertwined. lyda-Memories are meant to be treasured. I'm so happy you have happy ones too. kristen-It really is a small world, after all. Yes, I associate with escarole with Italian cooking and New England. It's kind of hard to find here, and when I lived in NC, I never found it. Thanks for your thoughtful comment. kalyn-Yes, it's a strange sensation, isn't it? Thanks! That's so sweet of you to say. ivy-What a beautiful comment. Thank you so much. fluer1181-Yes, she really was an amazing cook. I'm fortunate to have learned from her. val-Thank you for your kind sentiments. My grandmother passed away over 20 years ago and I still miss her dearly. I do make her Italian chicken soup but it could never taste exactly like hers but I smile when I make it, just like I do when I make her meatballs!! What a beautiful story about your Nan! There's just never a good time to lose a loved family member, even one who's had a long fulfilling life - so sorry to hear about your loss; your comment about "when will we see Nan" brought tears to my eyes. I think I'm going to have to make this soup in your beloved Nan's honor! What a lovely, comforting soup. My grandfather passed away in May at the age of 80, and I still remember him quite often, and he'll visit in my dreams from time to time, and it seems as though he's here again. By sharing this recipe with all of us, part of your Nan will live on - what a great tribute. Think about this. With our blogs we now have a history for our families to have and use. It is amazing the tie between food and good memories. Your Nan would certainly be proud of your recipe version, it looks delicious! How wonderful that she was able to be with you for so many years. What a sweet tribute to your grandma... what a blessing for you and your family to have had her for so many generations. This recipe is a treasure. This is the sweetest tribute to a lovely woman. A woman I didn't know, but you speak of her with such love that I know she was a wonderful grandmother. I can't think of a better way to honor your nan, so I will make this soup and think of you and her. This is such a touching post. Remembering loved ones through their recipes is an amazing honor and everlasting tie to them and their generous spirits. This soup is just the nosh I need while fighting a mighty cold, thank you for sharing. Autumn is in full swing here in Cambridge, MA. Your travels will be just in time for the foliage. Enjoy! My sympathies on the loss of your Nan, Susan. My grandmother passed just shy of her 102nd birthday 8 yrs ago; I miss her still. It's so nice to have real comfort food like this to remember people by. Great way to remember your Nnan! How lucky you were to have you Nan for so many years. It is still hard though, I understand. What a lovely way to remember and honor your grandmother. This soup would be perfect today, as it's very much Fall in Rhode Island. Soup season! we all have our own memories about all those soups and our grandmother! Miss her, too! I'm sorry to hear of your loss. I know it's difficult, but you were blessed to have had her in your life for so long. My favorite posts from your blog are those with your grandmother's (or mother's/father's) recipes. I have no recipes from my grandmothers and only a few from my mom -- who died over 40 years ago when I was a teenager. My gran passed recently as well. Like you, I still think I can go visit her and it comes as a shock when I can't. Thanks for the lovely story and remembrance. Grandmothers are special people. Ah, 'scarrole soup! Love it. Had it from my friends' nonnas as a kid in Jersey. Tossing some wild arugula into a simple lamb soup I made Sunday made me think of it. Ahh, grandmothers. What would we do without them? I miss mine, too! The soup looks gorgeous, and I've never heard of meatballs in chicken soup. Glad you left those out! I love how food can bring up some of the best of memories. What a great Nan you were fortunate to have in your life. debbie-Ah, yes, meatballs! Those too. It's wonderful that you have those memories as well. kara-You always leaves such thoughtful comments, Kara. Thank you. tastyeatsathome-Yes, you're right. That bond is nurtured through cooking, even when our loved one is no longer with us. theteachercooks-That is well said. Thank you. alisa-Yes, she would have been proud. Thanks. christine-Thank you for your lovely comment. I hope you do make it. It'll warm your belly and soul. jennifer-I'm sorry you're not feeling well. If it makes you feel any better, I've got a cold myself, and it's been in the 70s here. Get well! karen-101? That's wonderful! Though I completely know what you mean. You still miss them no matter how old they lived to be. annie-I think I'll miss that, but we're hoping for some glorious foliage! Have fun at the festival! lydia-I hope we experience some of that "fall" when we're home. bedroomdresser-That's a good thing too since we all need comfort now and then. wosnes-Oh, I'm sorry to hear that. Thank you for your kind words. regina-Yes, they are special people. abby-It's an Italian thing. You're not missing out. marie-Thank you for the lovely words. Gosh, this sounds just like my grandmother's chicken soup. She was 94 when she passed away, and up until that day she would cook Sunday dinner for the entire family. I can so clearly remember walking in her door while she was frying meatballs - standing on a little stool because she shrunk too much to reach the stove! Your post brought back great memories!